Keyed up for the street, the Reax Castor Short Leather Gloves were born to dig deep in the corners. All-leather construction, protective hard parts and double-layer outseams hint at a speed-hungry streak that can be harnessed but not tamed. I spent days, & hours each day watching Glove videos here on Revzilla. Then, I went to the store in Philly (yes you can visit, and it is amazing). By sizing online it said I would be a medium, but in person I found a Large fit better. This glove had to meet several requirements. I wanted a hard knuckle back, slider pad on the palm, and wanted two point touch phone sensitivity so I could use my phone without taking my gloves off. This meets all of those requirements, and at the price point it sits at, I love it. The only thing I will stress is that there is no ventilation. I was torn between these and the perforated version, but my hands are cold on morning and night rides so I grabbed these. While they are great below 70, once it gets over that, they are downright hot. I will be picking up the mesh version of these for Summer to compliment the all leather. Like the title says you have to give a little to get a lot, I was looking for a glove that offered more protection than my Joe Rocket Velocity 2.0 gloves after my friend crashed wearing the Joe Rockets I saw how they just didn't hold up and left his hand a bloody mess. I live in hell known as Florida and I wanted to find a glove that would stand up to a crash but also flow some air so my hands wouldn't be a dripping with sweat from my gloves. These REAX gloves do a decent job of airflow I rode on a day where it was almost 80 degrees and my hands did sweat but not so much I would give the gloves up. The protection features seem to be outstanding and I hope I never have to test them, the fit is pretty spot on I wore a large in the Joe Rockets and I went with a medium with these because I like a tighter fit and the large was just a little too loose for me, they are a bit stiff at first and I have finally gotten mine broken in after about 400 miles of riding. The touch pad index and thumb work fine and I have pretty consistent control when i use them on my Garmin and Android phone, the looks seem a bit chunky but if you're all about style you can pay a bit more and get some Alpinestars that have the same protection and features. I currently own the white pair and plan on buying the black ones soon. I have been searching for a good summer glove for a few weeks now. I stumbled upon these at a local shop and was instantly amazed. For $90 I got every feature I was looking for: hard knuckles, eva foam/tpr on fingers, full leather construction, pinky reinforcement, palm slider, wrist protection, and touchscreen compatibility. The closest glove I could find was the Celer, which lack protection on fingers, and lacks touchscreen on the thumbs for pinch/zoom. You will be hard pressed to find a short cuff glove as protective and with as many features as the Castors period, let alone under $100. The hidden reflective stripe on the pinky along with the reflective strech panels on the fingers are very nice touches. My hands do not get very hot in the summer, but they do get cold on mornings. I specifically wanted a glove with a bit less airflow. However, if you hold your palm out into the wind with these on, they do cool your hand down very quickly. I measure about 8.2-8.4 inches, and my mediums fit spot on. A bit tight in some places but I will update once they have broken in. I bought them for the look, the size chart was fairly accurate but the pinky finger is too long and middle finger and thumb are too short. Everytime I move to thumb the turn signal or horn I feel it tighten. Some of the seams in the index and middle finger put pressure on nerve in my fingers. They have broken in a bit now and it's not as much of a problem. They could use more air holes but that would make my hands cold on my morning ride. I had tried on several gloves, mostly the big name brands. However, I kept finding that most of the gloves in the $100 range, are either cheap quality or are uncomfortable. It seems like you either buy an inexpensive pair every season or you drop $250 for a nice set. When it comes to the Reax Castor, I found its quality and comfort far beyond other brands. It felt like my hand was wrapped in a nice fur blanket. I didn't feel any protruding seams on my glove that caused discomfort. It just feels smooth and secure. I can't give a higher rating for this glove. It's truly phenomenal. Liked these gloves right off the bat especially when compared to other top brands was a good buy, good quality and fit and finish just a very nice glove with thick enough leather where needed. My only issue and it is a big enough one to make me return a second pair. There are seems on the inside portion of the thumbs and they cause a high spot which turns into a painful pressure point against your grips. Fix that poor placement for a seem and I'd buy these again and again. I've tried about a half dozen gloves from the big brands but none of them fit my hands well. I had a great pair of Revit Bomber gloves that finally needed replacing. Revit apparently changed their sizing since five years ago. Their medium gloves fit my hands on the entry (opening) but their finger lengths are way long now. These REAX fit my hands pretty well in a small. And the touch screen finger tips works really well! I do wish the palm slider was a harder plastic than rubber - minor gripe. Overall, for the money, these are great gloves - highly recommend! 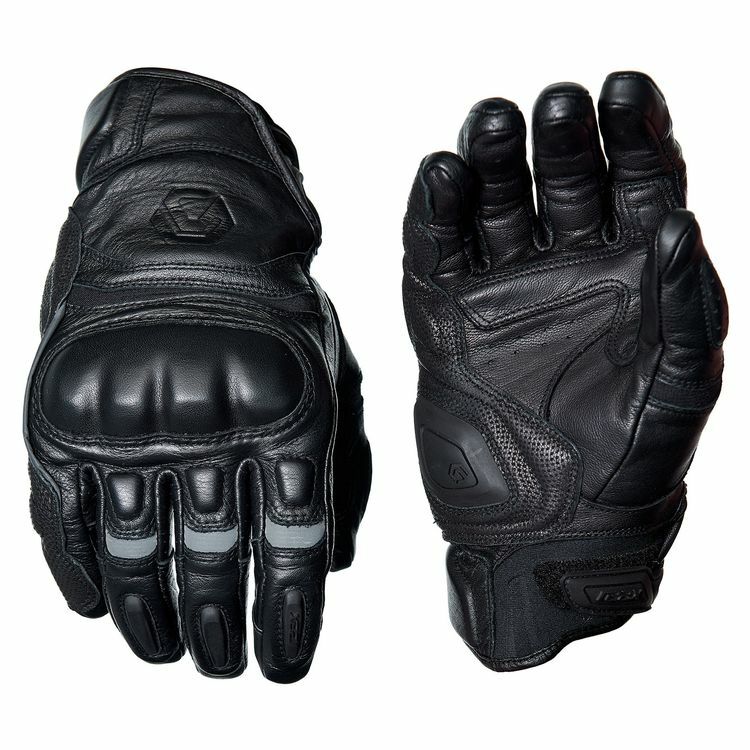 Inexpensive glove with a high end feel. These gloves have some great features for the price. The leather they are constructed of feels substantial, yet supple. In this day and age of technology, all gloves should have touch screen capability like these gloves do. Sizing seems to be right on with the sizing chart. My hand measured 10.5” and the XL fits like a second skin. Once they break in, they should be even more comfortable. It’s not often glove manufacturers get the finger length right, but they nailed it on these gloves. As always, Revzilla provided a good description and review. Kudos for fast shipping and great service!